Define your space with a custom gate or fence designed by Flores Artscape. 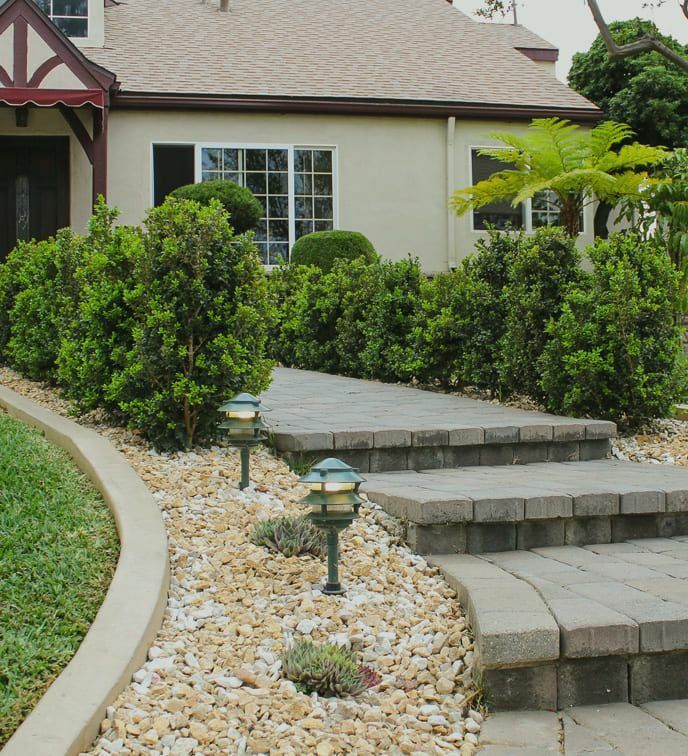 Stepping stones and pavers for a sensible and elegant addition to any yard. Save on your water bill with our California-friendly landscape designs. Flores Artscape’s pergolas provide shade plus an incredible atmosphere. Learn why Flores Artscape is one of LA’s most sought-after deck builders. Flores Artscape creates award-winning landscape designs that will give your home instant curb appeal and value. With an experienced team of artists, landscapers and builders; we help bring your vision to fruition. Flores Artscape provides the highest quality landscaping services because we take great pride in what we do and have done for over 10 years. 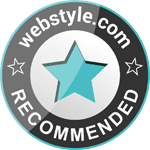 As part of our commitment to each and every client, we go above and beyond by ensuring reliable, professional service every step of the way. We only use top-quality materials and procedures to ensure your yard is properly designed and executed to stand the test of time and make the neighbors a little jealous too. We believe your outdoor space should be used just as much as any part of the home. That’s why we take care of all landscaping and outdoor home design quickly and efficiently, so you can get outside and start living in it. Flores Artscape brings your landscape to life with our personalized landscape design services. 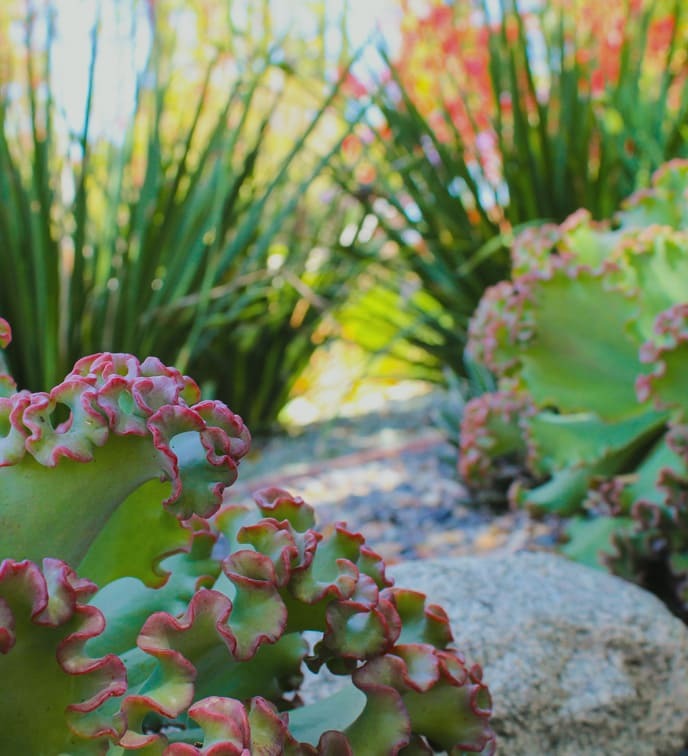 Whether you are looking to transform your overgrown backyard into a perfectly manicured oasis or need some added curb appeal with California-friendly plants in your front lawn, we can do it all. We are also well-equipped to custom build everything from fences to water features to pergolas. Flores Artscape infuses passion and expertise into everything we do. From beginning to end, we ensure you have clear communication, so no questions are left unanswered. Discover more on our blog or contact us today to schedule a comprehensive consultation for all of your hardscape and softscape needs. Everyone at Flores was very professional and friendly! I had great interactions with the owner Mr. Flores, project manager Eric, office staff, and the men who did the difficult labour on hot summer days. When I called the first time the staff was nice they booked my first meeting to discuss what we needed straight away. If I could give these guys a thousand stars I WOULD. Rumaldo and his guys are amazing! Over the course of the job, they became like family to us. Rumaldo is a great listener. He genuinely cared about executing our vision. He worked with our budget and delivered a flawless landscape! They turned our shabby, ugly, unsustainable yard into a beautifully designed, functional, environmentally sound space for the whole family. Thank you, thank you, thank you!!! Flores Landscaping worked with me every step of the way, even though I was on business trips and vacations most of the time. We communicated via phone and photos and once I got back, the yard was absolutely stunning! The team was amazing, no complaints, and very thoughtful and clean. I’m happy and will be enjoying dinners al fresco, movie nights outside my back deck, and just sitting outside watching my kids take advantage of our space! 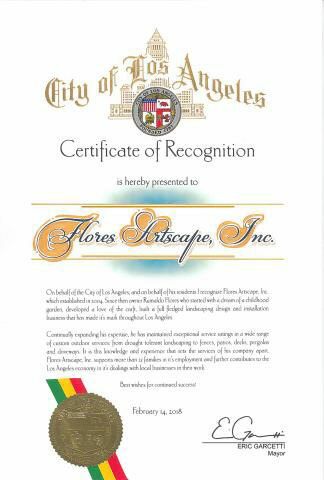 Flores Artscape & Rumaldo Flores, Company Owner, received certificates of Recognition from the Los Angeles Mayor for both their community support & exceptional service ratings.